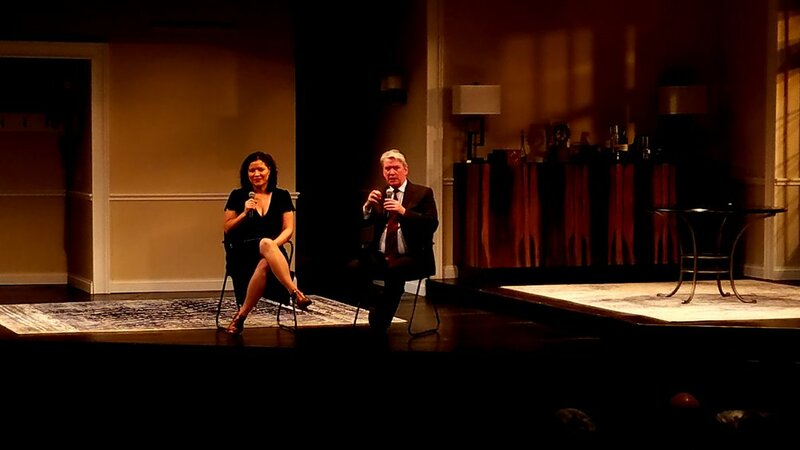 The Pulitzer Prize-winning production of Disgraced opened the door to welcome conversations about race, religion, and politics with our Hampton Roads community. Through our Sunday Talk Back panel discussions, post-show Second Act Conversations, and community dialogue, the Wells Theatre became a space for introspection and thought. A special thank you to the Tidewater Jewish Foundation for sponsoring all of our community engagement events for Disgraced. Another special thanks to our friends from Virginia Center for Inclusive Communities for equipping our staff with the tools and language to facilitate these conversations. The LENTEN SUPPER SERIES: DISGRACED AT VIRGINIA STAGE was presented in conjunction with St. Andrews Episcopal Church and St. Luke's. Tom Quaintance, VSC's Artistic Director and Disgraced Director, Khanisha Foster, joined cast members at the Lenten Supper Series as they talked about the show, the issues, and the impact of the art on community discourse. DISTURBING DISGRACED: DISCUSSING RACE, RELIGION, AND OTHER TENSE ISSUES IN A POST-MLK WORLD was a thought-provoking Brown Bag Lunch that encouraged participants to reflect on their own experiences and identities. Presented by the Center for the Study of Religious Freedom at Virginia Wesleyan University, Barbara Hamm Lee, host of Another View radio program, and Dr. Craig Wansink led the discussion as we highlighted key issues raised by the play: How do we as Americans become more aware of deep tensions and fundamental differences, how do we recognize the ways religion and race shape us, and how do we develop the skills to have more productive conversations with others? Audience members were invited to debrief and deliberate this one-act play during our SECOND ACT CONVERSATIONS. The tense and poignant moments in Disgraced span beyond the walls of the Wells Theatre. These post-show conversations allowed us to think about ourselves and our communities in the context of our current political climate. Our Sunday TALKBACK PANEL DISCUSSIONS gave room for thoughts of various expertise to shed light on the themes presented in Disgraced. Panelists included Honorable Roxie Holder, District Court Judge for the 3rd Judicial District in Virginia, and Ruling Elder, Presbyterian Church (USA); Rabbi Michael Panitz, Temple Israel in Norfolk; Dr. Tahani Amer, Senior Technologist at NASA Headquarters, and active member of the Peninsula Islamic Community Center and the Mosque and Islamic Center of Hampton Roads; and Mourad Amer, Engineer at Newport News Shipbuilding, and active member of the Peninsula Islamic Community Center and the Mosque and Islamic Center of Hampton Roads. The Disgraced cast, director Khanisha Foster, and VSC Producing Artistic Director Tom Quaintance provided unique insight into the show during our post-show panels as well. Check out these pictures below! Thank you to our community for showing up and speaking out.